When it comes to figures as famous as Harry Houdini, their legacies are often spread among many places. The magician was born in Hungary, died in Detroit, and in between, spent some time in New York City. 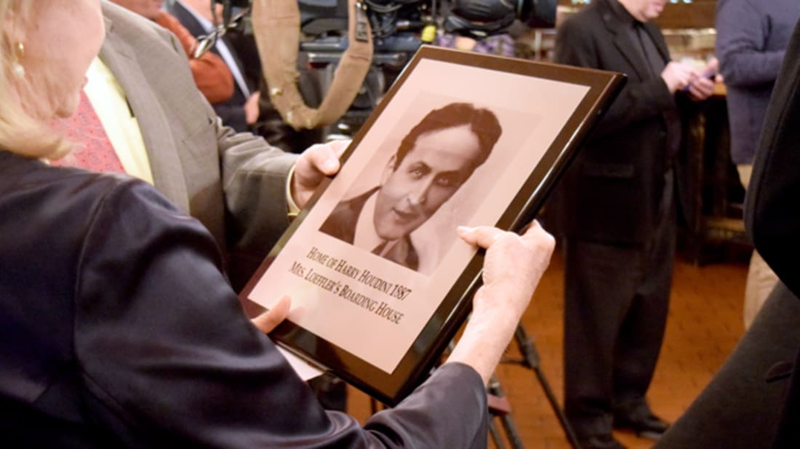 On Wednesday, October 26, Houdini's very first Manhattan residence on the Upper East Side honored that connection to the illusionist with a dedication ceremony. Today, 244 East 79th Street is the site of a restaurant, but decades ago it was home to Mrs. Leffler's Boarding House, where Houdini and his family stayed. Halloween marks the 90th anniversary of Houdini's death, and every year, the Society of American Magicians commemorates the date with a series of events known as Magic Week. Houdini served as president of the Society of American Magicians from 1917 to 1926. Houdini is buried at Machpelah Cemetery in Queens, New York and for many years, drew large groups of fans and spectators on Halloween, many of whom sought to continue a tradition of Houdini-seeking séances, encouraged in many ways by the man himself. Before he died, Houdini and his wife Bess agreed on a code phrase that he would use to try to contact her from the afterlife. She held séances for 10 years and never heard from her deceased husband. In later years, the Society of American Magicians performed more official ceremonies surrounding his death, and moved the date to November to avoid the Halloween crowds. They now keep the event private, and the grave is heavily monitored on the anniversary to prevent vandalism. As part of the plaque dedication, George Schindler of the Society of American Magicians performed the Broken Wand Ceremony, which is held for every member of the society who dies. During the speech below, the magician's wand, which is given to every member upon joining, is snapped in half. In addition to the plaque ceremony, a séance will be held for the first time at Houdini's Manhattan residence this Halloween. George Schindler with a pair of handcuffs used by Houdini and Houdini's younger brother/fellow magician, Theodore Hardeen. Photos and the broken wand. A Houdini display at the ceremony. The plaque, featuring the name of Deborah Hardeen, the granddaughter of Theodore Hardeen; Deborah was in attendance.